Tonight on Bravo The Real Housewives of Atlanta continues with an all new Sunday January 3, season 8 episode 9 called, “Shade for Days,” and we have your recap below. On tonight’s episode, Kenya continues to build her future dream home and discovers her family relationships are also in need of some construction as well. Porsha heads to Los Angeles to cover an awards show for Dish Nation, but will conflict with her sister Lauren compromise her performance on the red carpet? On the last episode, Porsha continued her long-distance romance with a beau she met in Miami in hopes that he may be “the one.” Meanwhile, Kenya remained true to her plan to “date like a man” and set her eyes on a younger man. Peter surprised Cynthia with a “first date” as the two continued on their path of reconciliation. A very pregnant Kandi struggled to wrap up loose business ended as she prepared to release new music with friend Demetria McKinney, proving that she could successfully work with friends. 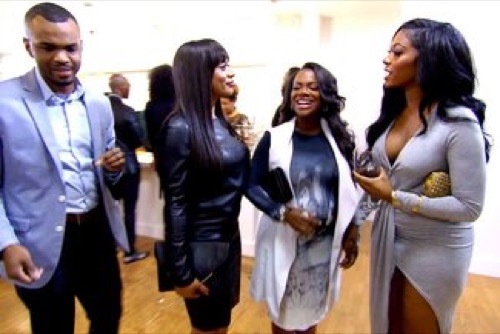 Later, the ladies gathered to celebrate the music collaboration and things got tense when Porsha and Phaedra were caught shading Kandi at her own event! Did you watch the last episode? If you missed it, we have a full and detailed recap right here for you. Shamea wanted to clear the air on tonight’s episode of “The Real Housewives of Atlanta”. So she went to Kandi’s office and, honestly, she thought she would be given a chance to explain what happened at the video launch party. However, she underestimated DonJuan. DonJuan is very opinionated and therefore he couldn’t help telling Kandi what he had walked in on. Which was both Porsha and Phaedra choosing to discuss Todd and Phaedra’s money issue openly. And right outside of Kandi’s event. Thus it didn’t matter that Shamea tried to say she and the other ladies weren’t gossiping. They were and it brought back a lot of bad memories for Kandi. Like when Phaedra and Porsha would both imply, especially behind her back, that she wasn’t a good friend. And so Shamea, while new, should take note. Never explain and simply act like nothing happened rather than be the one to bring said subject back up again. In other words she should act like Phaedra. Phaedra did later meet up with Todd at her office and she didn’t bother to mention her little spat with DonJuan. Instead she got straight to business, their business, and she listened to Todd as he explained how her last check never came in the mail. And that she failed to give him a photo he needed to complete her exercise video. And Phaedra was perfectly polite to Todd to his face. She laughed with him and said that everything will be handled so that they could finally promote their video together. But then she chose to throw a little more than shade in her confessional. As we know, confessionals are usually shot right after filming so like its hating on someone via twitter. There is no face to face confrontation. Though Phaedra went a tad too far. She was either always full of it or merely chose in the end that her relationship with both Todd and Kandi was not worth the effort. Because she ended up saying something that will come back to bite her. She had accused Todd of desperately needing money because Kandi must have cut his allowance that week. And speaking about someone else’s marriage is never a good thing. Which Phaedra knows from experience because she hated it when Kenya did it to her. But to then turn around and do the same to Kandi means there’ll be an interesting reunion this year. However, some things ended up spilling over on tonight’s episode. Kandi and Porsha were at Cynthia’s event to support her when they just had to have a discussion about what happened. And, well, they actualy got a chance to talk. Porsha had wanted to speak to Kandi on her own meanwhile Kandi wanted DonJuan to be there so that he could tell his version of events. And Porsha was offended that her word was no long enough. She felt like Kandi should have heard her out on her own without her clique and so she left Cynthia’s event after she became too upset to stay. Although, Carmon did attempt to follow her from the party and talk to her but Porsha couldn’t be bothered. She said she didn’t want to speak with any of Kandi’s underlings. She just wanted to speak with Kandi. And back at the party, Kenya couldn’t help herself. She got involved and she passed judgement in the only way she could. She heard that Todd and Phaedra had a good meeting. So she asked if Todd walked away with a check and when she found out that he left empty handed – she joked that he was never going to see a single cent. But that’s Kenya. She likes to say things and then laughs as if it was all a big joke though she wasn’t really laughing later when she had a heart to heart with her dad. Because it seems they had a falling out when she went to go live with him in Texas when she was 12 and later ran away back to Detroit. Kenya had been unhappy in the neighborhood and at her school. So she had run away and her father didn’t speak with her again until five years had passed. And therefore Kenya wanted to put the feelings from that time to rest. She’s dating again and the reason she thinks finding someone had always been so hard was because of her relationship with her dad. So Kenya talked about the past and she also convinced her dad into going to a family reunion that she’s arranging. In which she wants to repair other relationships in their family as well. Yet, despite the good we saw with Kenya, there naturally had to be some crap. And oddly Kandi was the one to bring it. Kandi and Porsha did talk one on one. And apparently their biggest problem has been the fact Kandi feels like Porsha has been taking Phaedra’s side. So Porsha tried to say that Phaedra needs her more but that set Kandi off. She said Phaedra didn’t even want Apollo around before he went to jail. So she doesn’t think Phaedra deserves a pity party.